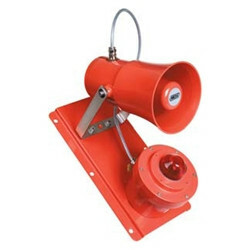 The XB11/DB425 UL X(70) RED RED fro Wheelock is a MEDC Weatherproof Strobe Combination Unit of 70VDC. The XB11/DB425 UL X(70) RED RED has a red finish and red lens. This range of audio/visual combination units may be assembled from a range of strobes and horns. Mounted on a sturdy, drilled, painted, stainless steel plate, the units are pre-wired as standard such that a single input operates both the sounder and strobe simultaneously. Units are available for use in potentially explosive atmospheres and dedicated units are now available for use in industrial and marine environments.